Some setup is required before using the Central Enterprise Management Tool ( CEMT ). These steps are required before you can launch the CentralManager.exe file (open the Central Manager main window). Place a blank copy of an Open Dental database in the C:\mysql\data folder. Rename it to identify it as the central manager database (e.g. dbcentral). If using Open Dental 17.4.83 or newer, a database for this purpose can be downloaded here: dbcentral_17_4_83.zip. 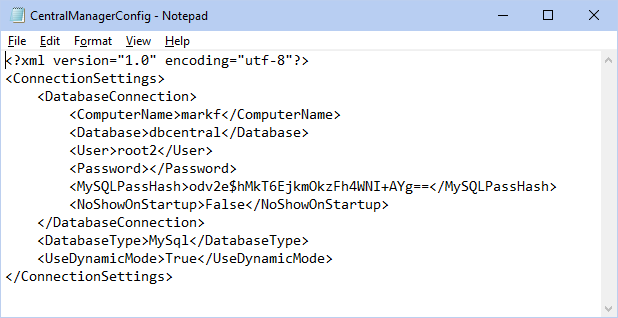 Extract the zip file into your \mysql\data folder. This database must be using the same version of Open Dental so you may need to update it. We strongly recommend that you Update to the latest stable version of Open Dental before using the CEMT tool. Right click on CentralManagerConfig.xml and save it in the Open Dental installation directory. By default, this path is C:\Program Files\Open Dental\CentralManagerConfig.xml. Change the ComputerName to reflect the name or IP address of the server. Change the database name to the central manager database (e.g. dbcentral). Save this file to Open Dental installation directory (typically C:\Program Files\Open Dental). Open Open Dental and select dbcentral from the Choose Database window. This will update dbcentral to your current version of Open Dental. Note: If the Choose Database window does not appear on startup, run Open Dental as a administrator, then go to File, Choose Database. Uncheck Do not show this window on startup (this computer only). Close Open Dental then try again. Launch CentralManager.exe from the Open Dental program folder to being using CEMT. You can create a Windows shortcut to this program to make it easier to open in the future. If the central manager database is hosted on a Middle Tier server, you must also add a new middle tier XML node for the URI: <MiddleTierAddr></MiddleTierAddr>. Add it directly under the password node. CEMT does not work for Middle Tier connection when using eClinicalWorks. Once the CEMT is launched, you can set up database connections and define users, permissions, and other security settings. Define CEMT Security settings (users, user groups, permissions, lock dates).